California State University, Northridge African Studies Interdisciplinary Minor Program hosts its 5th annual symposium. California State University, Northridge will explore the arts of Africa at the 5th-annual African Studies Symposium on April 12. 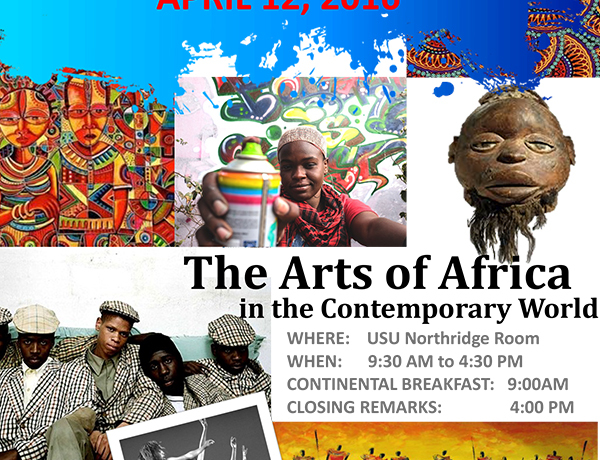 The event, which is themed “The Arts of Africa in the Contemporary World,” will take place from 9 a.m. to 4:30 p.m. in the University Student Union’s Northridge Room. Guest speaker David Donkor, a professor in the Department of Performance and Africana Studies at Texas A&M University, will discuss politics of performance in the contemporary African world. In addition to the speakers, there will be presentations made by several CSUN faculty members: Frances Gateward, professor of cinema and television arts; Peri Klemm, professor of art history; Sheba Lo, professor of Africana studies; Juliet Moss, professor of art history; and Ric Alviso, chair of the Department of Music. The minor in African studies is designed to provide an interdisciplinary approach to the study of African history, literature, politics, geography and cultures. It provides a background for advanced study of Africa and for careers in international development, humanitarianism, international law, journalism, social media management, museum curation, health and education, among other pathways. The event is hosted by the African Studies Interdisciplinary Minor Program and sponsored by the Office of the Provost, College of Social and Behavioral Sciences; and the Departments of Africana Studies, Anthropology, and Gender and Women’s Studies, and the African Students Organization. It is free and open to the public. For more information, contact Suzanne Scheld at (818) 677-4935 or Tom Spencer-Walters at (818) 677-7819.